In science, researchers extract information – data – with the help of model organisms like E. coli and zebrafish. That data might inform cancer research or new ways to help control antibiotic resistant pathogens. For most of us, however, the catch is that we don’t have access to model organisms or high-end microscopes, so the opportunity to see the visual beauty inherent in much of modern biology is out of reach. A former elementary school art teacher, Johnson labors now as a graduate student to bring science as art a bit closer, and to make it accessible to those of us who might not otherwise experience the subtleties that occur on a culture plate. As a part of her graduate program, Johnson has been folded into the research lab of Ahna Skop in the genetics department at UW-Madison. There, she has access to research subjects like E. coli, C. elegans and zebrafish embryos from a neighboring lab. Angela has learned how to use some of the research tools such as video microscopy and has become familiar with the culture and workings of the lab. “I’ve been welcomed aboard. I’ve presented at their labs meetings twice and have gotten great feedback on my artwork, and it is qualitatively different from the feedback I get from a critique group here,” Johnson said referencing the UW-Madison Art Lofts, where she has a studio. Johnson has been working a lot with E. coli, which the nematode, C. elegans, eats. Introducing chalk pigment into culture plates using pipettes and then incubating the culture, Johnson captures stunning micrographs, art created, in essence, by common microbes. 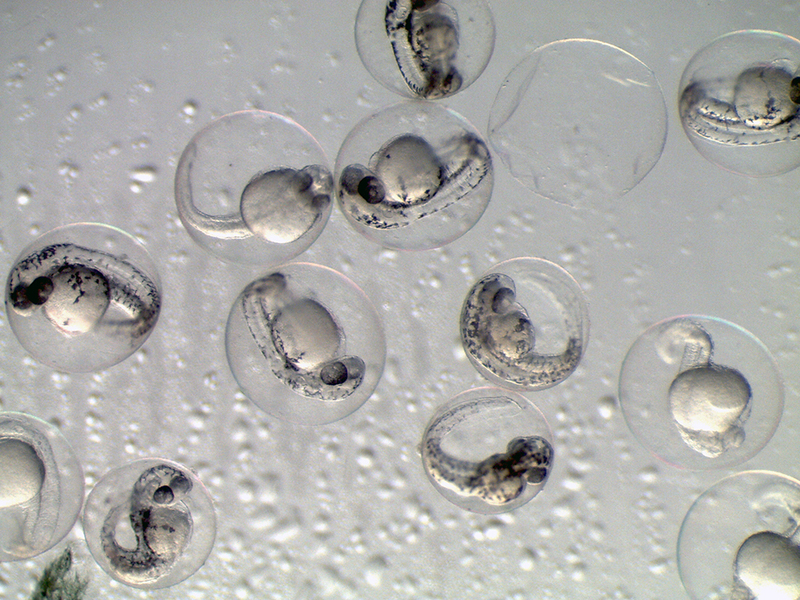 Johnson is also taken with the early stages of zebrafish development. Zebrafish in the last decade have become a widely used model in genetics and other disciplines, and imaging technologies used in concert with the model are providing scientists with stunning views of development, immune response and other aspects of zebrafish biology. An emerging piece in Johnson’s portfolio is a microwave oven-sized carved wooden box with a vintage keyhole and a small projector inside. Peer through the hole and you’ll be able to see a time-lapse video of the development of another key model in modern biology: the worm (a common term for the nematode) C. elegans. 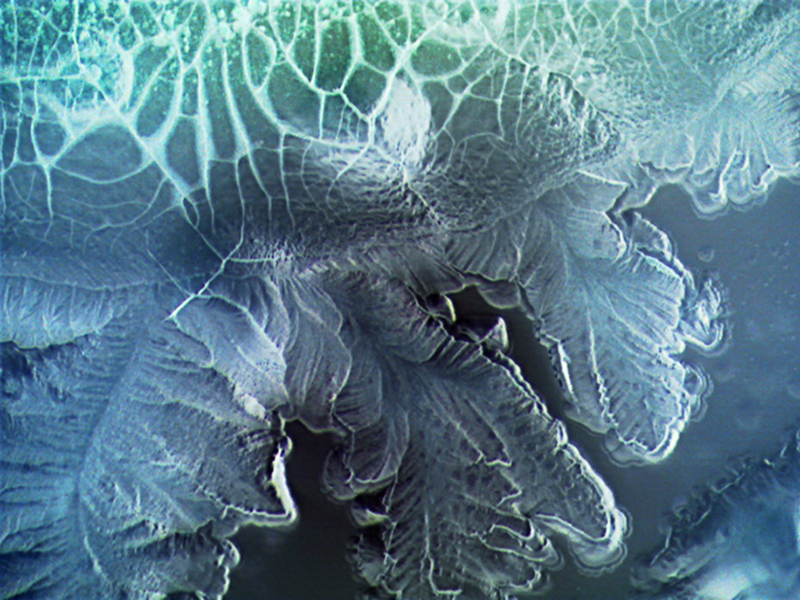 The idea, Johnson noted, is to create an old-time movie house feel, but one that takes you on a developmental journey courtesy of a tiny worm and modern microscopy. Johnson’s work will soon be on display: She’ll have a show as part of UW-Madison Science Expeditions on March 20, and a full-fledged art opening on April 10. Both events will be in proximity to the Skop lab in UW-Madison’s Genetics/Biotech building (425 Henry Mall) on the second floor of the new addition. It’s free and everyone is welcome.